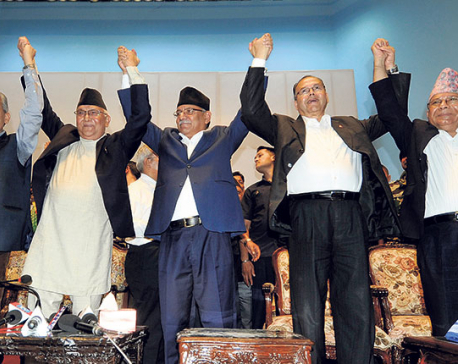 KATHMANDU, Oct 4: In a dramatic turn of events Tuesday, the chiefs of three left political parties-- CPN-UML, CPN (Maoist Center) and Naya Shakti Party Nepal-- have announced that the three parties are to unify. KP Sharma Oli of UML, Pushpa Kamal Dahal of Maoist Center and Baburam Bhattarai of Naya Shakti announced that the three parties will forge an electoral alliance to contest the upcoming elections for parliament and the provincial assemblies as their first joint task. The announcement about party unification and electoral alliance comes just a month ahead of provincial assembly and parliamentary elections. They claim that they will secure a two-third majority in the upcoming elections. UML stands as the second largest political party in parliament and also emerged as the largest in the local polls while Maoist Center is a distant third. The Bhattarai-led Naya Shakti is yet to face parliamentary elections and it also made a very poor showing in the recently concluded local polls. Oli, Dahal and Bhattarai inked a six-point deal Tuesday on forging an electoral alliance, forming committees and task-forces to finalize the unification, preparing a joint manifesto for upcoming elections, preparing a party statute and other documents, and not trading blame in the transitional period, among other things. The parties have formed a joint committee led by Oli and Dahal to coordinate the unification process. The committee includes four members from UML, three from Maoist Center and one from Naya Shakti. “We have agreed to unify the three parties as per the long-cherished desire of the people for a single, unified communist party that would lead the country to prosperity,” former prime minister Oli announced at a function at a jam-packed Rastriya Sabhagriha in Kathmandu. “The UML, Maoist Center and Naya Shakti are now headed toward becoming a single unified party,” Oli said. He said the unification coordination committee will start work immediately on all the remaining tasks. Oli also announced that Baburam Bhattarai’s Naya Shakti will contest the upcoming elections under the UML’s election symbol of sun. He said they have been trying to manage everything as per their plan to ensure that Maoist Center candidates also can contest under the same election symbol. “Since we are becoming a single party, there is no need to contest under different symbols. But there are some technical and legal hindrances and we are trying to settle these as well,” Oli added. Addressing the same function, Dahal said they had been putting in efforts for a long time to unify the parties as per their goal of a single communist party. “We had been working hard for this moment. We also worked on the documents and exchanged them but we couldn’t succeed at the time probably because the time wasn’t ripe,” said Dahal. Both Oli and Dahal repeatedly emphasized that their unification bid was guided by the need of the country and wasn’t aimed at harming anyone. Bhattarai said that with unification between the three parties, they aim at securing a two-thirds majority in the upcoming elections for parliament and introducing a directly-elected presidential system for the sake of stability. “This force will secure a two-third majority in the upcoming parliamentary elections and introduce a directly-elected executive system in the country,” he said. All three top guns announced they will work for bringing about economic prosperity, strengthening nationalism, safeguarding the sovereignty of the country and forming a single communist party. They hailed the decision as a major achievement in the history of communism in Nepal since the formation of the first communist party at the initiative of the late Pushpa Lal Shrestha. UML and the Maoists together have over 260 seats in the-591 member incumbent parliament and have formed four governments in the decade since the Maoist insurgents joined party politics.